Recapture the moment, the past is a PRESENT that LASTS! Don’t let those old photos fade away! For some, these are the only links we have between the past and present. Preserve memories of a lifetime so future generations can enjoy them. Home Fair Camera in Larchmont provides restored photos so you have them as a keepsake for many years to come. Have an old photo you need to have restored, or maybe one you want retouched? Stop in to meet with one of our Restoration Specialists and learn more about our photo restoration services. 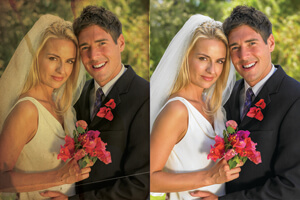 This includes fixing color, cracks, rips, and having someone placed in or removed from a photo. Estimates are provided upon request. The finest things in life are made of memories, and nothing brings a memory to life like an old photograph. Show off your old photos—we repair stained, spotted, torn, cracked, bleached, and faded images every day. Good memories deserve a second chance. Time goes by, but memories remain. This year, give something unforgettable: restored photos. No gift is more valuable than a rekindled memory. If your photo is faded or damaged, we can fix it. You’ll get a brand new archival print so your photo will last as long as your memories. Just bring in your original photo for an estimate. Let’s make the holidays a season to remember! Bring in your photo today. Note: Please do not call and ask for price quotes over the phone before we see the restored photo(s). Prices fluctuate depending on the quality of the photograph, plus the required amount of time and work needed for the restoration. You will receive a quote for your approval within 5 days, by either phone or email.